If you are looking for a same day loan, you may find it useful to ask yourself some important questions. CashLady explores some of the most commonly asked questions and considerations related to same day loans. Same day quick loans might be an option if you need an emergency cash injection. Loan products such as these may often be advertised as: payday loans, small loans, emergency loans or short term loans. When should I use a same-day loan? Quick, same day loans are often needed by UK consumers who require quick financial solutions in cash emergencies. For instance, your washing machine could break down at an inconvenient time and you might be financially unprepared for the additional bill. With a prompt credit solution, you could get money by the end of the day. Some UK lenders may deposit your funds into your bank account in minutes. Would I qualify for a fast payment, same day loan? To qualify for same day credit you need to meet a set of lending criteria. The requirements are usually your age, residential and employment status. To apply for this loan you would need to be over 18 and be a UK resident. In addition, you should be in full-time employment and have an income of at least £500 per month. Most short term finance providers require a UK bank account. If approved for a credit facility, the money will usually be transferred into your bank account which will usually be the same account your direct debits will be taken from. During your loan application, you may be asked some personal questions such as your marital status, place of work and your monthly income. Consumer credit firms require this information in order to get a complete picture of your financial circumstances. Any Financial Conduct Authority (FCA) regulated lender first considers your personal well being and the level of burden the credit might put on you after you apply for a loan. Can I get a same-day loan without undergoing a credit check? Did you know that more than 30,000 people in the UK look for finance without a credit check every month? Despite the huge number of search queries, there is no real ‘same day loan no credit check’ product. FCA authorised firms must investigate your credit history and ensure that you are able to repay the loan on time and in full. There are many other ways to borrow money if you are not confident with the credit check requirement. However, for you own security you may choose to deal with authorised lenders rather than with illegal firms or a 'loan shark'. To check if your lender or broker has an FCA authorisation, search the Financial Services Register. Are there same day loan for bad credit history? People with a poor credit history will often search the internet for ‘same day loan with bad credit’. In most cases ‘bad credit’ or ‘adverse credit’ occurs when borrowers fail to make their monthly financial commitments. Many FCA authorised lenders such as Cashfloat or QuickQuid consider loan applications from consumers with a less than perfect credit history, although a poor credit score may reduce your options regarding financial products. During a formal credit check, the lender will assess your past and current circumstances to ensure they offer the right credit product for your needs. What if I'm not approved for a same day short term loan? If you are not approved, there might be several reasons why. You may not satisfy the eligibility criteria required by lenders or it may happen that people have made unfortunate financial decisions in the past which affected their credit profile. In cases such as these, this article may provide some beneficial insight into how to improve your credit score and get approved for a loan. To increase your chances of receiving funds, you may also consider applying through a credit broker. If you apply for a loan with Cashlady, your application will be sent to a panel of FCA regulated lenders thereby increasing your chances of obtaining credit. Should I consider a short term loan today? It depends on your circumstances. In some cases, the loans we facilitate may help to manage finances or inject some extra cash in an emergency. However, you should always keep in mind that you will have to repay this credit in full and on time. Always ask yourself: Will I be able and willing to keep up with all the payments in 3 or 6 months time? Can I afford the loan repayments? How can I apply for a loan and receive it same day? You can apply for a loan at cashlady.com or choose direct lenders we work with (e.g. MyJar, Lending Stream or Quickquid). If approved, our lenders will make same day transfers using faster payments. How quickly you will receive the loan will depend on your bank as well as how quickly the lender makes a decision and processes your loan. If you are applying for a small loan of up to £1000 you may expect the money to arrive at your bank account the same day. Many lenders send your cash in 15 minutes, if approved. 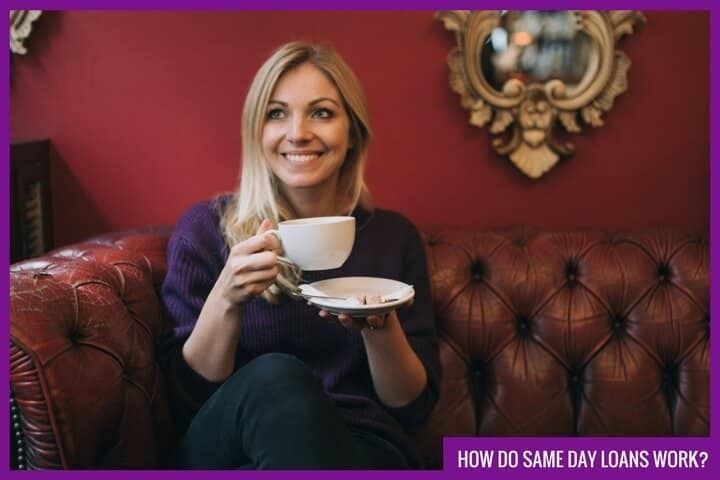 How do same day loans work in the UK? Same day loans work in the same way as other short term loans. The truth is that there is nothing new to same day loans. Existing technology allows for cash transfers to take place in minutes. There are no extra charges for same day transfers nowadays and it's quite common and standard practice to receive cash same day, if approved. To apply for a loan you will need to complete an application. You can use online operated lenders or brokers. In this case, your online application will usually take just a few minutes to complete. Otherwise, you can visit a high street shop or a pawnbroker where you will be assisted with your application. No matter what service you choose, make sure to check that the lender is FCA authorised. Try to complete your application as accurately as possible. Have your ID and bank account details to hand as they may be requested during the loan application process. If your loan product is unsecured, you will typically be required to undertake a formal credit check. Depending on the personal information you provided and your credit history, your request will be either approved or rejected. If your loan application is successful, you will receive an offer from a matching lender. The conditions of your credit, such as the amount borrowed, interest rate, any additional fees and repayment term, will be set up automatically and specified in your financial agreement. You will usually be required to repay your loan by direct debit. If arranging a direct debit from your bank account is impossible for any reason, you should contact the lender to discuss your options. How much can I borrow on the same day? The amount that same-day loan companies lend may vary between £100-£1000 depending on the borrower need and situation. Do I need a guarantor to apply? It depends, unless specifically mentioned, most unsecured lending would not need guarantor. Popular short term credit products (such as payday loans) will often process quick payments without any guarantors. However, credit facilities that do require a guarantor may be able to process same day loans if requirements are satisfied in time. Will I get a same day loan today, if approved? Yes, if approved. Borrowers could receive a loan on the same day it was applied for, and the money can be transferred to the borrower's bank account. The only time that a lender may require longer processing times will be due to compliance requirements and manual underwriting and affordability checks where necessary. Is there an extra cost for same day transfer? If you apply for a Lending Stream loan of £200 over 6 months at an interest rate of 292.0% p.a. (fixed), the total amount repayable will be £383.68 with no additional fee (Representative 1325% APR). Sometimes the figure for a representative APR might confuse you. You are not alone. For your peace of mind, in 2014 the Financial Conduct Authority (FCA) issued a set of regulations protecting borrowers who use high cost short term credit (HCSTC). You should know that for any high cost short term (e.g. over 100% apr) product a daily interest rate cannot exceed 0.8%. However, the length of the credit term can significantly increase the cost of funds. When you apply for a same-day loan or receive a personal quote, it may be useful to consider shorter term finance options. At Cashlady we do not charge any fees for our service. We are 100% free. However, any successful borrower will be required to pay interest on received funds to the lender. What are guaranteed same day loans? There are no guaranteed same day loans. It is a commonly held belief that unfortunately is not true amongst authorised lending institutions . On the internet you will find many UK lenders that advertise ‘guaranteed same day loans no credit check’. However, any FCA authorised loan provider must carry out a credit check to ensure that the consumer's wellbeing will not be affected by additional credit. If someone offers you money without a credit check, you might be dealing with a loan shark. Loan sharks do not hold an official authorization to lend money. They also might charge an extremely high interest rate and blackmail you, if you cannot keep up with your payments. Can I get a same day loan if I am unemployed? You can apply for a loan, but there is no guarantee that your request will be approved. In addition, short term loans might not always be a good solution for unemployed individuals and people on benefits. Most likely you will not be approved in these circumstances. The major consideration in this situation should be whether the additional funds will solve a problem or make it worse. In this situation, you might consider alternative solutions such as borrowing money from a family member or friend or, simply, postpone the purchase until you get back on solid financial ground. Are same day loans usually secured? Unless otherwise stated, same day loans are generally unsecured credit products. Secured loans tend to involve larger sums of money over longer repayment terms. Bear in mind, that even if you do not risk your valuables, a late or missing payment might cause financial problems in the future. Applying for a loan, people may feel more secure dealing with direct lenders rather than brokers. Lending Stream, MyJar, Satsuma, Ferratum are among the most trusted short term loan providers in the UK. However, excluding financial brokers from your consideration, may cause you to miss some opportunities. Dealing with a Financial Conduct Authority (FCA) authorised brokerage company such as Cashlady, you would expect to receive the same level of security, data protection and service as if you chose a direct lender. For example, at Cashlady, it is our primary concern to protect our client's data in the best possible way. Being a fully FCA authorised and ICO compliant company, we will never ask for information directly unrelated to your query and never pass your data on to third parties without your permission. Do CashLady offer same day payday loans? Cashlady do not provide credit to customers. We are a broker, not a lender. However, at cashlady.com you can apply for a same day loan and your application will be considered by our panel of short-term loan providers including MyJar, Satsuma, Ferratum or Lending Stream. In a financial emergency, same day loans could sometimes help. If you are looking for a same day loan you should consider applying with a lender or a licensed credit broker such as ourselves. The application process is nearly identical to applying with a lender, however with a trusted credit broker you are more likely to get a successful decision whilst saving time and energy. 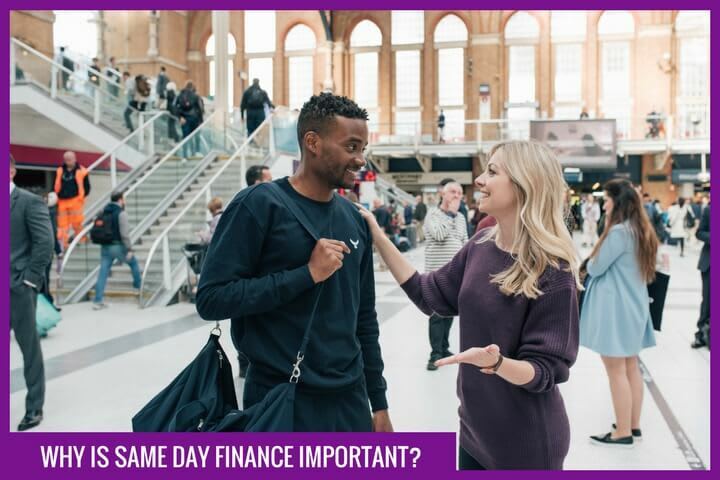 What are same day short term loans in the UK? How do online loans facilitate same day lending?